If your online store is configured to calculate shipping charges per item, define here how much to charge for the shipping of the product. It can be either a preset charge, or a charge specific for this product. Each product can have as many options as you want, and the new interface allows to easily create, edit and delete options. To define the order in which they should be displayed, simply drag and drop them. The changes you make are automatically saved in the background. You should define a label and a price. You can define an internal reference that will be displayed in your store order pages. You can choose to track the available inventory. Every time an order is placed, the option's inventory is decremented. 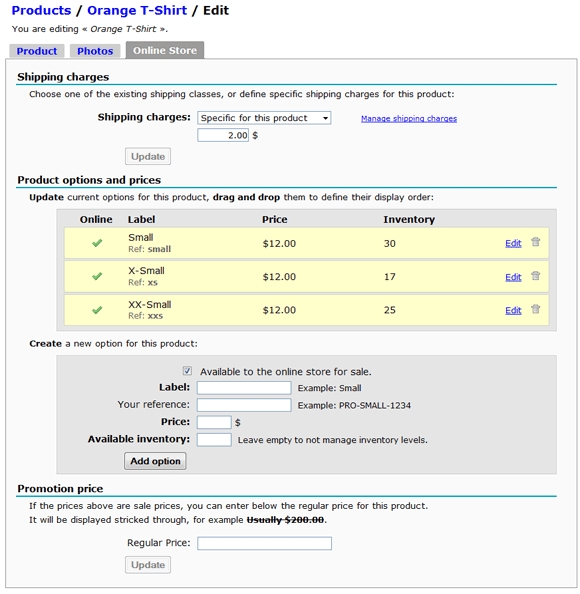 Once inventory reaches 0, the option cannot be ordered from your website anymore. Make sure to not sell more products than you have on hand! We hope that you will like the new functionalities. As always, support@ugal.com is an excellent way to reach us with any questions or comments. In the mean time, happy sales!